When you get home from work, what could be better than a delicious golden pie waiting for you. The recipe this week is exactly that. 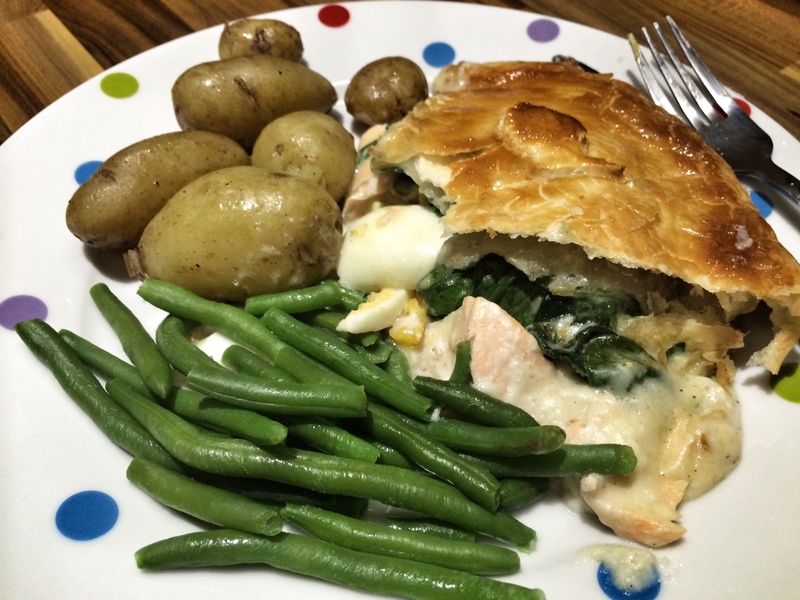 The texture of the poached salmon, spinach and sauce complement the crispness of the pastry. The dish is filling yet moreish, so don’t skimp on portion sizes. I always make enough food for one and a half times the number of mouths to feed…If they don’t want seconds, I know I will! If you can’t finish the pie in one evening, it does keep in the fridge overnight, so you can reheat for an instant lunch the next day. 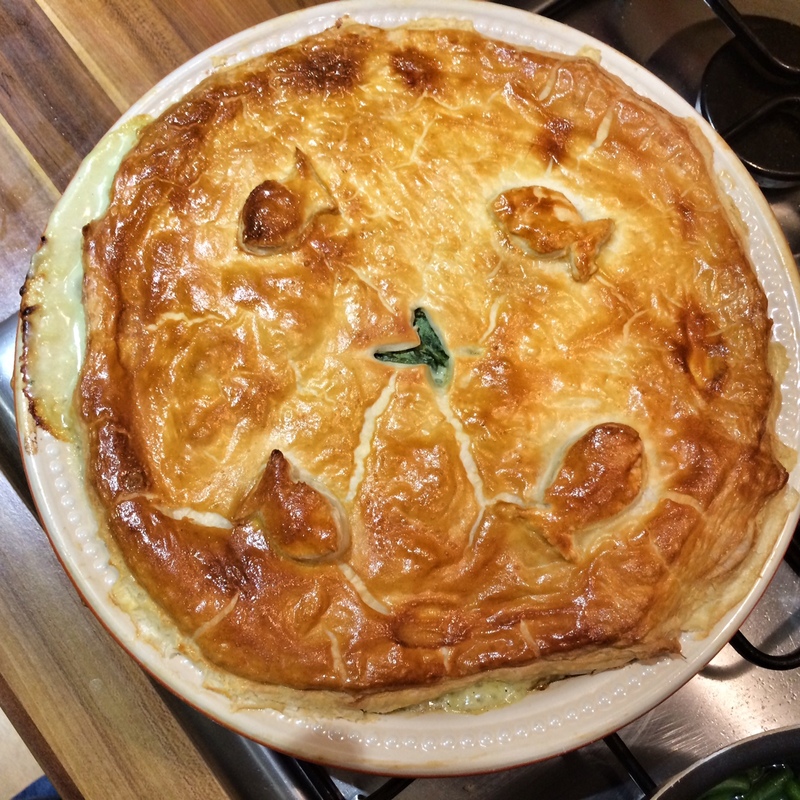 I’ve served the pie with Jersey Royal potatoes, which are currently in season, so should be available in all supermarkets at the moment. They have a distinct flavour and are delicious served coated in a small amount of butter and a few pinches of seasoning. In a small saucepan boil the eggs for 8 minutes, then plunge into cool water to stop them cooking. Peel, chop up and set aside. In a sauté pan over a medium heat, add the milk and bay leaves and leave until almost boiling. Add the Salmon fillets and poach for 8 minutes until the fish is just cooked. Take off the heat then carefully remove the salmon, reserving the milk. In a pie dish, flake off the salmon fillets into fork-sized pieces, discarding the skin. 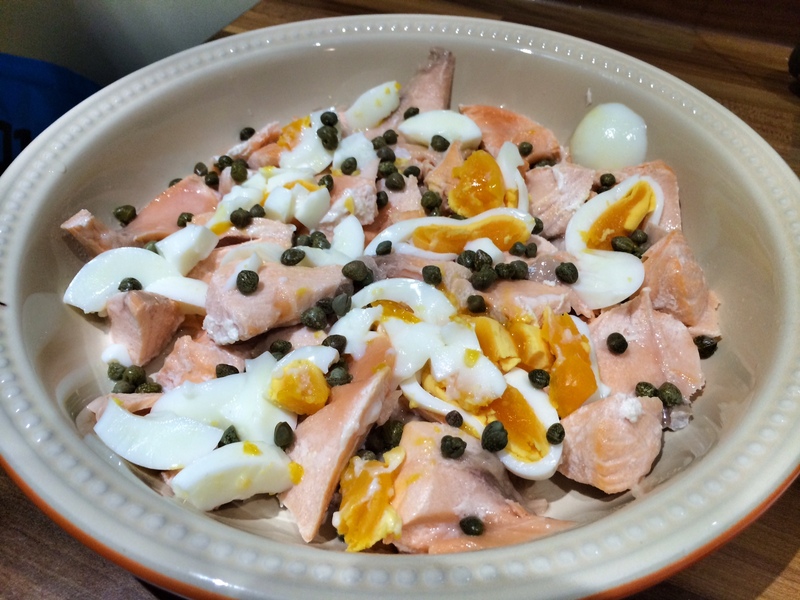 Toss in the chopped up egg and capers at this point too. At this point, pre-heat the oven to 200ºC. Over a medium heat (and a new pan) wilt the spinach, which should only take a couple of minutes if you get a wooden spoon in there too. Then evenly apportion over spinach the pie dish. In a small pan, melt the butter. Then add the flour and beat together over the heat for one minute. 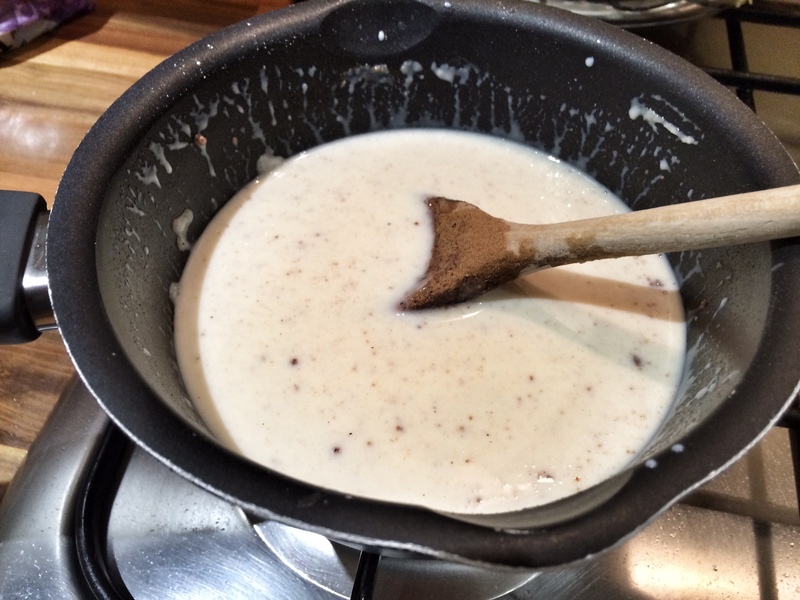 Take the pan off the heat, then gradually add the milk continually stirring. Add the nutmeg and give one final stir together. Pour into the pie dish over the other ingredients. Now time for my favourite bit: the pastry. Dust a work surface down with sprinkling of flour. Then roll out the puff pastry to about ¼cm thick. Transfer onto the pie dish and cut off the trimmings with a sharp knife. 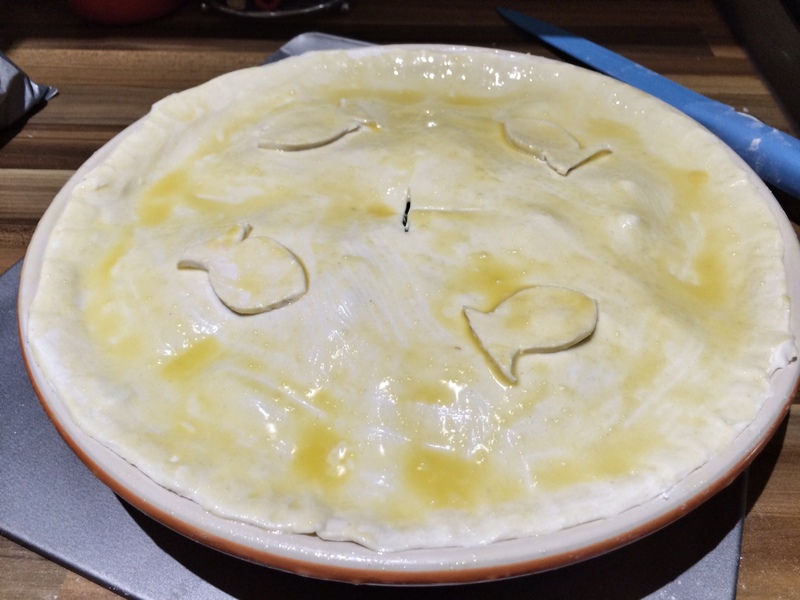 Pinch the edges to seal to the pie dish as best as possible, then cut a slit in the middle to allow steam to escape. Lightly beat an egg and gently brush all over the top of the pastry. Put in the oven and leave to cook for 25-30 minutes. 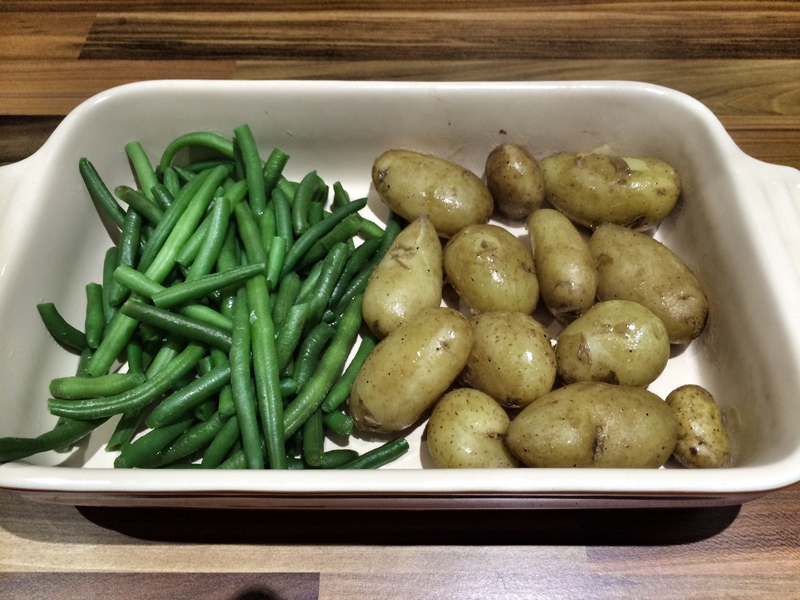 15 minutes before the pie is ready, boil the Jersey Royals and steam the green beans. Drain the potatoes, add a knob of butter, a large pinch of salt and several twists of freshly ground pepper. Serve everything together and enjoy (with a glass of Pinot Grigio).